Kings XI had never beaten Rajasthan Royals in Jaipur. But R Ashwin, at the toss, said this team didn’t carry “excess baggage” like that and they showed it. With the bat they overcame a slow start thanks to Chris Gayle’s 79 off 47, and with the ball they weathered a Jos Buttler onslaught, with Ashwin himself running the batsman out when he was out of his crease at the non-strikers’ end. Gayle was 14 off 18 at the end of seven overs. And that’s credit to the Royals. They started with Dhawal Kulkarni, who has dismissed the West Indian three times in 31 deliveries in the IPL. Then came offspinner K Gowtham possibly because Gayle has a strike-rate of 115 against them in this tournament. And finally Jofra Archer, whose extra pace and skill at hitting a hard length (not short enough to cut nor full enough to drive) continued to keep the boss quiet. Even when Gayle was at the crease, the highest score that Kings XI might reach, according to ESPNcricinfo’s Forecaster, was 180. They ended up with 184 thanks to a superb cameo from Sarfaraz Khan. The 21-year old may well have ended up with this team because they wanted to address the weakness that cost them a playoff spot in 2018 – a middle order that couldn’t match up to the openers – and on Monday, with an array of the most audacious scoop shots, he showed he is up to the challenge. he finished unbeaten on 46 off 29, including smacking Ben Stokes over midwicket off the last ball of the innings. “The idea of peaking isn’t really an idea that sits naturally in my mindset,” Buttler told reporters prior to his departure to India. “Sometimes you hear people talking about going to another level. Why can’t you just stay at peak level?” Based on his last seven IPL scores – 67, 51, 82, 95*, 94*, 39 and now 69 – the answer to that question is a loud Y-E-S.
R Ashwin was about to bowl the last ball of his spell and Buttler was at the non-strikers’, backing up. The offspinner saw it, turned around and calmly broke the stumps. The event sparked visibly heated exchanges between the two players, and prompted outrage , but it was, technically, within the laws of the game. Buttler was out of his crease before the bowler had delivered – which has happened before – and like then he was made to pay with his wicket. Meanwhile, Royals’ win probability dropped from 50% to 36% – all during the course of the six balls of the 13th over. Andrew Tye was the highest wicket-taker in IPL 2018, but he was still in Australia and unavailable for this game. So on came Sam Curran, who was bought for over a million dollars at the auction, and was walloped for seven boundaries in his first 12 balls. 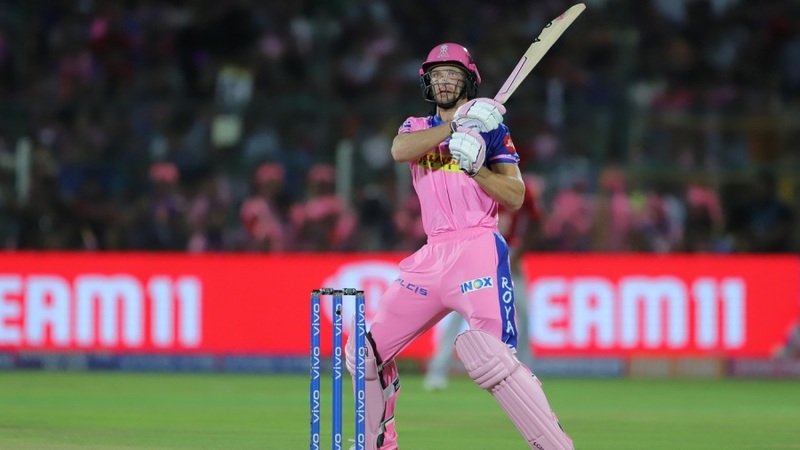 With Royals needing 39 off 24 balls, the England allrounder came back for his final over, dismissed the returning Steven Smith and Shane Warner’s tip for MVP of the IPL Sanju Samson – and virtually sealed the game.